After a summer of missions, I do have stories. Most of the Ecuador ones belong to SUSIE Magazine. God did great things in Quito, and I have a full notebook—and heart—to prove it. My Panama trip, July 30-August 7, 2011, rose from my relationship with Dr. Walker Moore and student mission-sending organization, Awe Star Ministries. This year, they invited me to minister alongside them in the beautiful country of Panama. Since God and I often talked about my desire to serve there, I received the invitation as His answer. “Engage the culture!” Dr. Moore emphasizes this truth in Awe Star’s missionary training. In order to prepare the way for the gospel, a missionary must get involved with the people by any means possible. As his writing partner, I knew the teaching. But I didn’t know God would provide early-morning, in-my-face instruction. I’d left home at 3:30 am, so as soon as I landed in Miami, I headed for the restroom. My goal: to brush my hair and teeth, switch glasses to contacts, and otherwise make myself presentable before I met the team. So much for making myself presentable. I paused only long enough to inform my questioners that I was on an Awe Star trip—theirs, in fact. Outwardly, I smiled. Inwardly, I scolded myself. Why hadn’t I spoken first? What about “engaging the culture”? How could I do on the mission field what I wouldn’t do in the airport? God has ways of making His point. And this time, I got it. A few minutes later, I left the restroom prepared to engage the thirty-plus member team. When I reached the gate, I introduced myself to the adult leaders. Then I circulated among the students, asking questions here, speaking a word there. I received some stares. But I also received smiles, questions, and the beginnings of the relationships I’d asked God to build. The value of my outward appearance? Little. The value of Christ-in-me? Much. We hadn’t yet left the country. But the adventure had already begun. 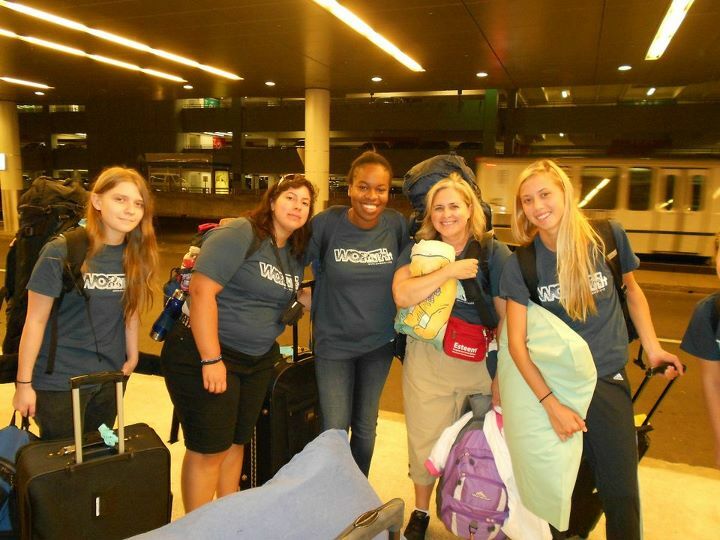 Have you taken a mission trip? Or helped send others on one? I’d love to hear your stories, too! Thanks, Ava. I’m looking forward to writing them! I do wish I’d known you were passing through South Florida — I’m probably 30 min. from the airport! Can’t wait to read all about the trip. I didn’t realize where you were, Laura! For this trip, I flew down from Orlando. But on the SUSIE Magazine one, my husband and I drove to Ft. Lauderdale where he dropped me off for training. Maybe another time!